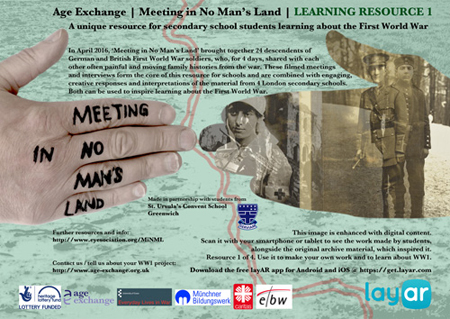 In April 2016, 'Meeting in No Man's Land' brought together 24 descendents of German and British First World War soldiers, who, for 4 days, shared with each other often painful and moving family histories from the war. 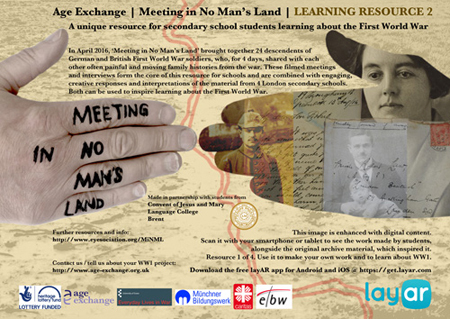 These filmed meetings and interviews form the core of this resource for schools and are combined with engaging, creative responses and interpretations of the material from 4 London secondary schools. 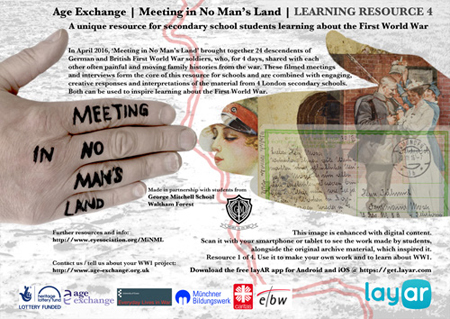 Both can be used to inspire learning about the First World War. The 4 main learning resources have been created - using layAR augmented reality software - for use with mobile devices. 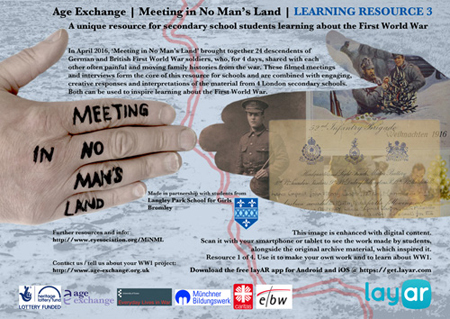 This is a digital resource that can easily and simply be shared by students, teachers and educational institutions - either electronically or physically (via a printed poster or flyer). 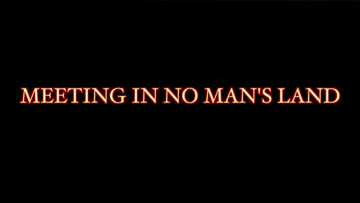 You will of course require a Wi-fi or data connection for your device. Once you have downloaded the software, click to enlarge the images below. Scan the image with your Smartphone or Tablet to access the digital content. The images can be downloaded and emailed to friends and colleagues or printed-out and pinned to school or classroom notice boards; the software will scan equally well from a screen or a postcard-sized printout.